The SquintMaster (strabismus software ) is designed and developed by Dr. Sudhir Singh, M.S ( Ophthalmology). Dr Singh has been practicing ophthalmology since 1995.Besides phaco surgery, manual small incision cataract surgery and glaucoma surgery , he has special interest in pediatric ophthalmology and strabismus. He did his M.B.B.S and M.S (Ophthalmology) from S.M.S. medical college, Jaipur , India. Dr Singh has been associated with J.W. Global Hospital & Research Centre ,Mount Abu, India, since 1999 and presently working as senior consultant & head , department of ophthalmology .He is also a visiting senior consultant Global Hospital Institute Of Ophthalmology ,Aburoad,Sirohi India. 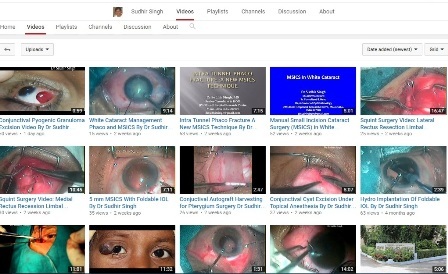 Dr Sudhir Singh is having special interest in Strabismus and Pediatric Ophthalmology and got privileged to work with Dr. T. Otis Paul, M.D under Orbis International sponsored Hospital Based Training Programme and Dr.Robert O Hoffman, M.D, Professor, Pediatric Ophthalmology & Strabismus,University Health Care Moran Eye,Salt Lake City,Utah in Flying Eye Hospital Flying Eye Hospital Training Programme at Jaipur in Oct 2009. 5.Post refractive surgery IOL Power Calculating Software. 7.Phakic IOL Power Calculating Software. The strabismus software is very user friendly .Users need not to have any formal computer training to use SquintMaster software. This complication can occur at any stage of cataract surgery. MICS Phaco With Aquafold Foldable IOL By Dr Sudhir Singh.